Following the tragic death of her husband, Amelia is a left to bring up her extremely demanding son, Samuel. She is absolutely exhausted as, plagued by nightmares, Samuel keeps her awake - every night. Stretched to breaking point, she still makes time to read to Samuel every night. One night, they find a new pop up book called The Babadook. Amelia starts to read - only realising just how dark and scary the story is midway through. By then, however, it is too late and mother and son begin to be terrorised by the book's main character - The Babadook. I was really dreading watching this film. I was worried that it would either scare me stupid or upset me given the mother's relationship with her son. However, determined not to wuss out - this is a film challenge after all - I watched The Babadook. This is an amazing film and such a refreshing take on the horror genre. Throughout, you are never completely sure that the Babadook exists. It is a figment of Amelia's psychotic breakdown? Is Samuel a supernaturally evil child? The fact that you are never sure who the monster really is ramps up the tension - raising The Babadook to a much higher level than your average horror fare. The other thing that elevates this film for me is the characterisation. You really care about Amelia and Samuel. You completely believe that she is desperately sleep deprived, grief stricken and isolated. As for Samuel - he seems, at first, to be a very troubled little boy. You then wonder if he is actually just a victim of his mother's grief and depression. I felt desperate for them both - even without the threat of the Babadook. Having successfully made me care about its main characters, the film then built up the tension, the horror and the scares. 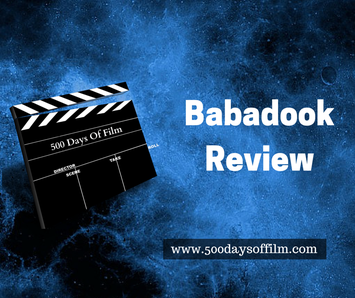 The Babadook was gripping, scary and creepy and the story really stayed with me. All in all pure brilliance and all you could want from a horror film. Essie Davies is completely wonderful in her role as Amelia. In addition, I truly don't know how director, Jennifer Kent, got such an amazing and haunting performance from Noah Wiseman. Have you seen this film? Did you enjoy it? Whether you did or if you thought it was a waste of time, let me know - there's a comments section below!